A WEST Belfast man is preparing to take on a 800km cycle challenge through France and Spain to celebrate five years since a devastating stroke almost claimed his life. 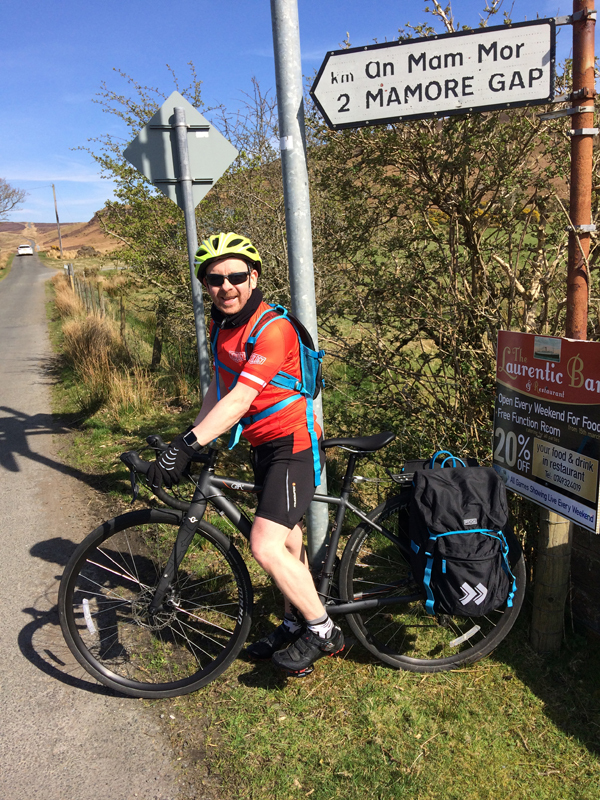 Dr Colin Gorman, 43, who is originally from Lenadoon, is planning to tackle the gruelling Camino de Santiago route during May 2017, cycling from St Jean Pied de Port in South France, across the Pyrenees to the North of Spain. He is aiming to raise awareness of the impact of stroke, especially amongst younger people, as well as raising vital funds for the Stroke Association – the leading charity for people affected by stroke. Dr Gorman now lives and works in Derry where he is a lecturer at Ulster University. Father of three Colin had a stroke in May 2012. He collapsed at home, without warning, and was admitted to hospital. Doctors discovered Colin had experienced a rare form of stroke – a subarachnoid brain haemorrhage which was caused by bleeding on the surface of the brain. He endured 4.5 hours of brain surgery as doctors tried to stop the bleeding. Colin said: “This was a life changing moment which set into action a long chain of challenging and traumatic circumstances not only for me, but undoubtedly more so for those around me. I received fantastic medical treatment in the acute stage but on discharge, information, support and services were extremely limited. Nothing really prepares you for stroke. I had difficulty with my memory and concentration and I was exhausted all the time – sleeping for up to 20 hours a day on discharge from hospital. The fatigue has improved greatly since this time but continues to be one of the more persistent and frustrating symptoms of the stroke”. Colin, who is a Clinical Psychologist and Lecturer at Ulster University, battled back from illness to continue his work at the Magee campus and is now focusing on new research into the impact of subarachnoid brain haemorrhage. Colin says this life changing illness inspired him to overhaul his lifestyle and set himself the cycle challenge. “Before my stroke, I had never been sick, but I worked at 100 miles an hour and rarely said no to anything. I had a busy career, working at the University, for the NHS and in private practice. We had our three young children and were moving house. It was hectic. Looking back I realised that maybe something had to give, and the physical impact of the brain haemorrhage means that in general I have to be a lot more pragmatic about life. “The recovery has been slow and frustrating but after around three and a half years when I recognised that my functional recovery had plateaued I realised that I wasn’t doing the basics of looking after myself. So, in December 2015 I decided I needed to set myself goals and targets and to take control of the factors that I could take control of. I started to eat better, do a bit more exercise and to take the rest that my body needed. Nine months later I completed the Derry Half Marathon and decided I wanted to do something big to celebrate life five years after my stroke. So, that’s when I decided to do the cycle – it’s a big personal challenge for me and will mark a real milestone in my journey”. Colin’s mum Roisin Gorman said she never expected a stroke to be responsible for hospitalising her son at such a young age. “On the night he suffered his stroke he was getting ready for football, he was fit and healthy, then all of a sudden he collapsed. He woke up in Altnagalvin Hospital were he had suffered an aneurism before being transferred to the RVH for a six-hour operation. Colin hopes that by sharing his experience, more people will understand the impact of different types of stroke. Colin is collecting donations via Just Giving https://www.justgiving.com/fundraising/Colin-Gorman-Camino2017 When you give to the Stroke Association, you can be sure your donation will help people affected by stroke near you, funding vital Life After Stroke Services in the North of Ireland.